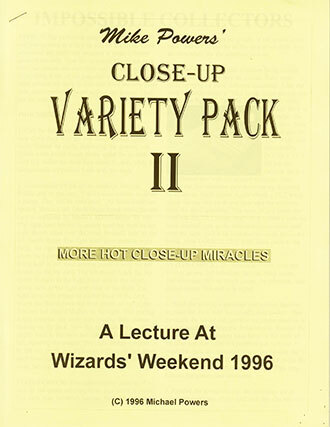 Close Up Variety Pack vol. 2 is the second in the "Variety Pack" series. It was launched at Wizard's Weekend in Minneapolis in 1996. Variety Pack II contains seven close-up items using cards, coins, rubber bands and business cards. A couple of items appreared in Power Plays in 2006.